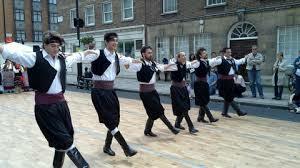 The Sirtaki is a popular Greek dance, designed by Giorgos Provias for the movie Zorba the Greek (1964). It is not a traditional folk dance, but a mix of existing and simplified Hasapiko dancing. The music is by Mikis Theodorakis. It is also called like the film: Zorba's dance. The name comes from the Greek word Sirtaki syrtos (slower traditional Cretan dances) and pidikhtos, (dancing with more hops and kick movements). The simplest version is often done at parties. Locally it is made a bit ​​spicier with gears, or with additional kicks and jumps. Given an instrumental song: no texts or translations. It is danced in a circle or in a row next to each other (nose in the same direction). Everyone puts hands on the closest shoulder or upper arm of his neighbors. Of course, the steps have to follow the rhythm of the accelerating and slowing music. The dance direction can be arranged reversed. With each pass, the supporting leg is slightly bent. Place the left back in the line of dance beside right.